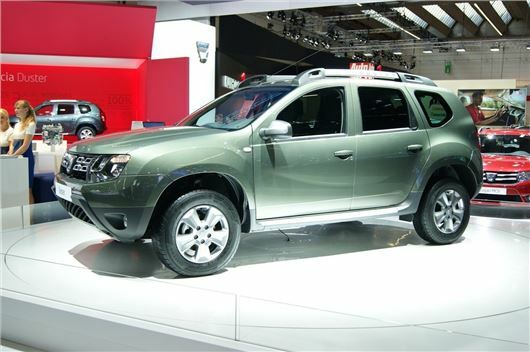 The updated Dacia Duster has been unveiled at this year’s Frankfurt Motor Show. Featuring an upgraded and aggressive looking exterior, the new Duster is perhaps the strongest indication yet that Dacia could be looking to shake off its reputation as a maker of simple and affordable cars. However, the revisions only apply to left hand drive cars at the moment - it won't reach the UK until 2016. The dynamic looking 4x4 gets a new front end, with a redesigned grille, chrome-plated strips and double-optic headlights. The rear of the car gets a similar rugged treatment, with the addition of a chrome-plated tail pipe. Other improvements include new roof bars and a set of stylish 16-inch Dark Metal alloy wheels. David Durand, head of Dacia styling said: “We have strengthened the 4x4 cues of the vehicle, while keeping all its useful features. The new Duster now gets an even stronger character while retaining its initial DNA."